MANILA, Philippines (UPDATED 11:19 a.m) - President Duterte is allowing security forces to take their time on the Marawi crisis even as he stressed that the operations against the Maute terrorists would continue until the last terrorist is killed. Duterte said there are around 300 civilians who are still trapped in the battle zone. “We will finish it. We are not joking. Until the last terrorist is taken out, the war will continue. They have 300 hostages there and that is what is delaying (the operations),” the President said during his second state of the nation address. “Sabi ko, huwag mo muna i-assault (I told them not to launch an assault) if possible. we just have to wait it out,” he added. Duterte said the safety of the civilians remains the primary consideration of government forces. “I don’t care if they are Moros or Christians. I don’t want these innocents to be slaughtered so hintay lang tayo (let’s just wait). Patience,” he said. The militants, mostly members of the Maute group, rounded up civilians in the country’s only Islamic city, even before the government began its offensive. Fighting erupted in Marawi City after security forces tried to arrest wanted Abu Sayyaf leader Isnilon Hapilon. 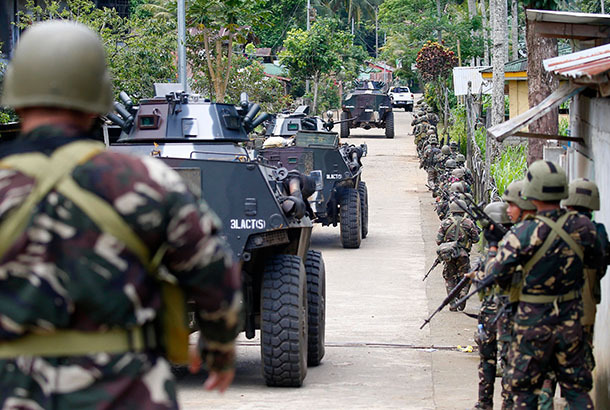 More than 400 terrorists and close to 100 government troopers have been killed since the clashes started last May 23. On the same day – while in Russia on a state visit – Duterte issued a proclamation placing Mindanao under martial law. “So much time has lapsed, so many lives have been lost and so much destruction has been wrought but peace eludes us still. Sometimes I am almost tempted to conclude that peace might not be able to come during our lifetime,” the President said. “But believe me, it will not be for want of trying. And I will persist in our goal of attaining peace (up) to the last day of this administration and maybe even beyond, although in a different capacity,” he added. “I declared martial law in Mindanao because I believed that that was the fastest way to quell the rebellion at the least cost of lives and properties,” the President said. “At the same time, the government would be adequately equipped with the constitutional tool not only to prevent the escape of rebels who can easily mingle and pretend to be civilian evacuees only to re-group in another place to fight another day, but also to prevent them from spreading their gospel of hate and violence in the rest of Mindanao,” he added. Last Saturday, Congress overwhelmingly approved Duterte’s request to extend martial law in Mindanao until Dec. 31 amid concerns that military rule could lead to abuses. “Martial law and the suspension of the writ of habeas corpus enable the military to arrest, detain and question suspected members and sympathizers of the rebellion similar to what happened to the parents of the Maute brothers,” Duterte said. “As President, I am reiterating my unwavering support and commitment to the soldiers of our Armed Forces and the members of our police force – those who are on the ground and in the battlefields and those who are risking their lives for our country and our democracy. I have your backs,” he added. Meanwhile, the Supreme Court (SC) has junked consolidated petitions seeking to compel the Senate and the House of Representatives to convene jointly to review President Duterte’s martial law declaration in Mindanao. Voting unanimously in regular session yesterday, the justices of the high court dismissed the petitions filed by separate groups, led by former senators Rene Saguisag and Wigberto Tañada, for lack of merit. While all magistrates voted to junk the petitions, they differed on the grounds for dismissal. Thirteen of them held that the high court could not compel Congress, agreeing with the argument of the Office of the Solicitor General (OSG) that it has no power to issue the mandamus due to the separation of powers of the judiciary and the legislature as coequal branches. They also ruled there was no grave abuse of discretion on the part of the Senate and House in separately affirming the martial law declaration in separate resolutions.